Each topic of this section guides you through the steps required to perform one of the actions related to calendar events. As there is usually more than one way to start the same action, only the most straightforward way is described here. Follow the links at the end of the topics to learn about the alternative ways to start the action. 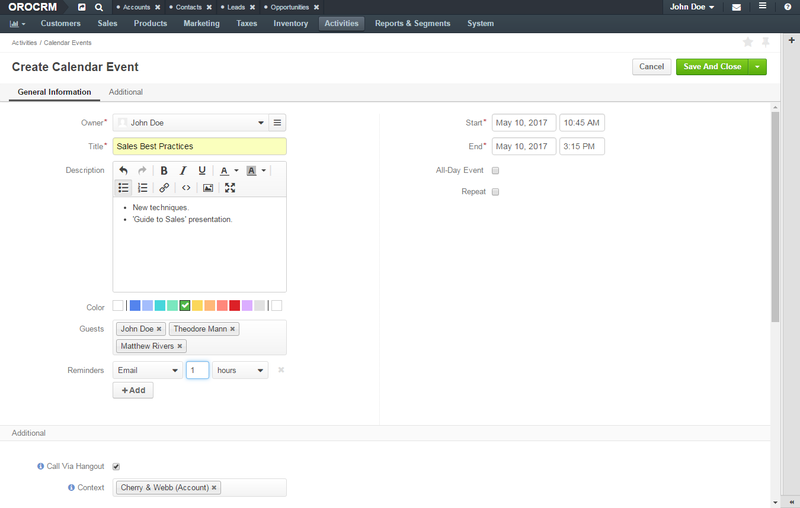 Get more information on adding a calendar event from other perspectives. In the grid on the Calendar Events page, click the required calendar event. Alternatively, you can click the ellipsis menu at the end of the corresponding row and then click the View icon. Review the calendar event details. Get more information on viewing a calendar event from other perspectives. 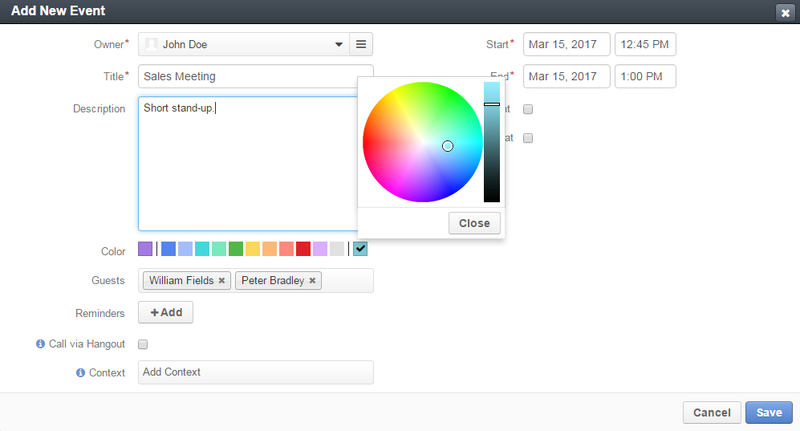 Get more information on editing a calendar event from other perspectives. You can change the assigned time frame during the editing of the calendar event, but you can also change it directly in the calendar. By default, you can edit only those events that you own. When viewing a calendar in the My Calendar page on in the Today’s Calendar widget, you can change the event time frame. Change the event start time by dragging the event to the new time slot: click the event in the calendar, hold the mouse button, and drag the event to the desired time. Change the event duration by extending the event: hover over the bottom of the event box for = to show, and drag it to fill the desired time frame. In the grid on the Calendar Events page, click the ellipsis menu at the end of the row of the event you would like to delete and then click the Delete icon. Get more information on deleting a calendar event from other perspectives. In the grid on the Calendar Events page, select check boxes in front of the events that you would like to delete. Click the ellipsis menu at the end of the grid header row and then click Delete. In the grid of the Calendar Events page, click the required event. On the calendar event view page, click the Add Context button in the upper-right corner of the page. In the Add Context Entity dialog box, select an entity of the related (context) record from the list in the upper-left corner of the dialog box. 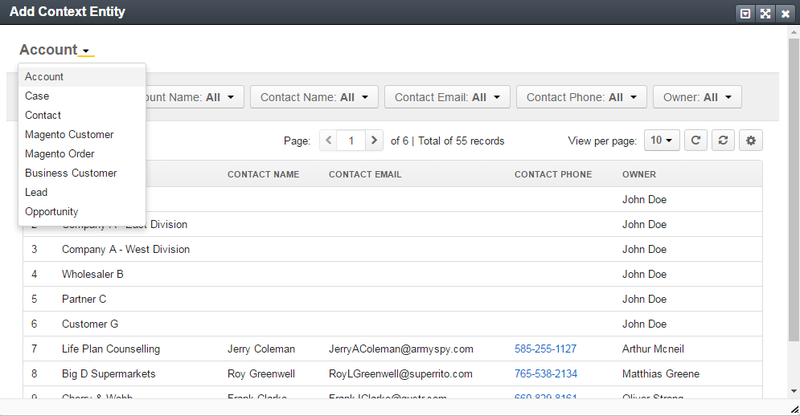 In the main grid of the dialog box, click the required record. The context record is added and is shown on the event view page under the calendar event name. Get more information on managing a calendar event context from other perspectives. On the calendar event view page, under the calendar event name in the upper-left corner of the page, click the x icon next to the context that you want to remove. On the calendar event view page, click Comments. In the Add Comment dialog box, enter your comment. 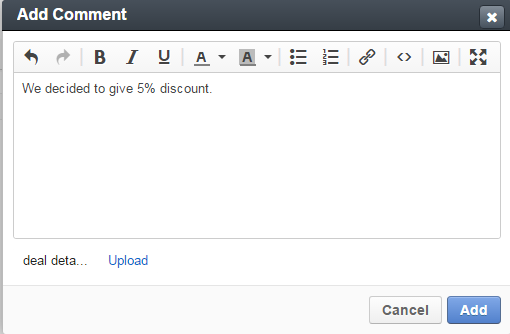 If rich text functionality is enabled for you, you can format your comment in the editor. You can also add an attachment to your comment. Your comment appears in the Comments section of the calendar event view page. You can edit or remove your comment: find your comment and click the ellipsis menu at the end of the corresponding row. Then click the Edit / Delete icon. Get more information about commenting on a calendar event from other perspectives. In the grid on the Calendar Events page, click the ellipsis menu at the end of the row with the event you want to reply to and then click either the Accept, Tentative, or Decline icon depending on whether you are going to attend the event. Get more information about responding to a calendar event from other perspectives. If the event was planned as a Hangout meeting, you can join it from the calendar . The Hangouts functionality must be enabled to make Hangout calls possible. Contact your administrator or see Google Integration Settings for more information. On the calendar event view page, click the Start Hangout button in the upper-right corner of the page. Get more information about joining a Hangout meeting event from other perspectives.